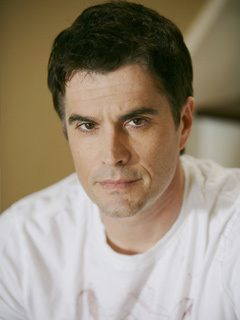 Rick Hearst joined the cast of GENERAL HOSPITAL in November of 2002 as the passionate Ric Lansing. He grew up in New York in a tight-knit Italian Family. Rick’s fascination for the ocean and sea life would have led him to a career in oceanography but, at the age of twelve, his focus shifted to acting when his mother remarried and they moved to Texas. Rick went on to land an acting scholarship at The University of Texas in Austin. He starred in several theatrical productions while at U.T. in summer stock, and met his wife, Donna, in one of the productions. Knowing he wanted to pursue a career in acting and feeling that the acting coursework was not intense enough, Rick left university and moved to New York, where he quickly landed three agents. Rick received the Emmy Award for Outstanding Younger Actor in 1991 for his work on GUIDING LIGHT. He was also nominated three additional times in supporting categories. In 2004, he won the Emmy for Outstanding Supporting Actor in a Daytime Drama. In 2007, he won the Emmy again for Outstanding Supporting Actor in a Daytime Drama. In 2009, Rick left GH and returned to BOLD AND BEAUTIFUL to once again play Whip. Rick and his wife live in the Los Angeles area with their two sons, Nicholas and Cameron. In his free time, he enjoys shooting pool and playing the guitar. His official Web site is www.rickhearst.tv. His real last name is Herbst. Started studying karate after he was mugged in New York and now has a black belt. Auditioned for the role of GH's Stavros, which went to Robert Kelker-Kelly. Is a longtime friend of Sean Kanan (Deacon, Y&R) whom he met while Hearst was working as a waiter. Directed a children's production of Peter Pan in 2011. Rick Hearst is shooting an episode of THE VAMPIRE DIARIES. Rick Hearst is back on GH, again, as Ric Lansing — and the actor is delighted that the news is music to viewers' ears. EXCLUSIVE! RICK HEARST BACK TO GH! Fan favorite Rick Hearst (ex-Whip, B&B; ex-Matt, Y&R et al) is back filming at GH as Ric Lansing. The play's just one of many things for BOLD AND BEAUTIFUL's busiest body, Rick Hearst (Whip). Whip is finally back on BOLD AND BEAUTIFUL after months of fan anticipation — and no one's happier than Weekly and Rick Hearst! We dish Whip's new boss, Jackie, where Whip may fit in, and how long it's been since Hearst won his first Emmy.